Fibonacci was an Italian Mathematician known for the Golden Proportion, a mathematical equation present in all things beautiful. This Golden Ratio appears in everything from Flowers, Architecture & DNA … to Beautiful Smiles! Fibonacci was known in his time and is still recognized today as the "greatest European mathematician of the middle ages." He was born in about 1170 and died in 1250 and there is now a statue commemorating him located at the Leaning Tower end of the cemetery next to the Cathedral in Pisa. Fibonacci's name is also perpetuated in two streets the quayside Lungarno Fibonacci in Pisa and the Via Fibonacci in Florence. His full name was Leonardo of Pisa, or Leonardo Pisano in Italian since he was born in Pisa. 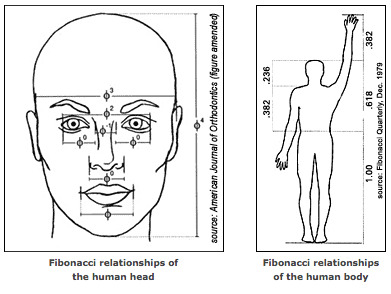 He called himself Fibonacci which was short for Filius Bonacci, standing for "son of Bonacci"; his father's name. Leonardo's father (Guglielmo Bonacci) was a kind of customs officer in the North African town of Bugia, now called Bougie. So Fibonacci grew up with a North African education under the Moors and later travelled extensively around the Mediterranean coast. He then met with many merchants and learned of their systems of doing arithmetic. He soon realized the many advantages of the "Hindu-Arabic" system over all the others. He was one of the first people to introduce the Hindu-Arabic number system into Europe-the system we now use today- based on ten digits with its decimal point and a symbol for zero: 1 2 3 4 5 6 7 8 9 and 0. The Fibonacci numbers are Nature's numbering system. They appear everywhere in Nature, from the leaf arrangement in plants, to the pattern of the florets of a flower, the bracts of a pine cone, or the scales of a pineapple. The Fibonacci numbers are therefore applicable to the growth of every living thing, including a single cell, a grain of wheat, a hive of bees, and even all of mankind. Harmonic analysis of the Parthneon. The Fibonacci sequence is 1, 1, 2, 3, 5, 8, 13, 21, 34, 55, and so on. It begins with the number 1, and each new term from there is the sum of the previous two. The limit ratio between the terms is .618034..., an irrational number variously called the "golden ratio" and /or the "divine proportion," but in this century more succinctly "PHI" (f ) after the architect Phidias, who designed the Parthenon. In other words, any two adjoining numbers equal the next higher number. For example, 5 + 8 = 13. Any number divided by the next higher number gives a ratio of .618. For example, 8 / 13 = .618. Any number divided by the next lower number gives a reciprocal of 1.618. In the lower numbers the ratios are not exact, but close enough for practical purposes. To keep things simple, those numbers are refered to as .62 and 1.62. Both the Fibonacci Sequence and the Golden Ratio appear in natural forms ranging from the geometry of the DNA molecule (and the human body) to the physiology of plants and animals. In the past few years, science has taken a quantum leap in knowledge concerning the universal appearance and fundamental importance of Fibonacci mathematics. Some of history's greatest minds, from Pythagoras to Isaac Newton, have held phi (f) and the Fibonacci sequence in the highest esteem and reverence. Harmonic logarithmic structure of the Nautilus shell with phi (f). "All human senses, including hearing, touch, taste, vision and pain receptors, have not only spiral physiology, but also response curves that are logarithmic (having a Fibonacci structure). Cellular action membrane potentials, which are important for muscles and nervous system, have a voltage equal to the log of the ratio of the ion concentration outside the cell to that of inside the cell. The brain and nervous systems are made from the same type of cellular building units and look similar microscopically, so the response curve of the central nervous system is probably also logarithmic."